Educational qualification for appeared to TS Gurukulam admissions notification 2018:The Students should be a bonafide of 6th class during the academic year 2017-18 in any Government School or any recognized school of under the Telangana Govt. The Parental income of aspirant for the year 2017-2018 should not exceed Rs.1,50,000/- per annum for rural areas. Selection :Selections of the candidate through TGCET 2018 with rule of reservation. Officials will be conducted 5th class admissions through counselling for selected candidates. How to Apply: Before filling the tgcet 2018 application, Candidates are advised to download and read the prospectus carefully. 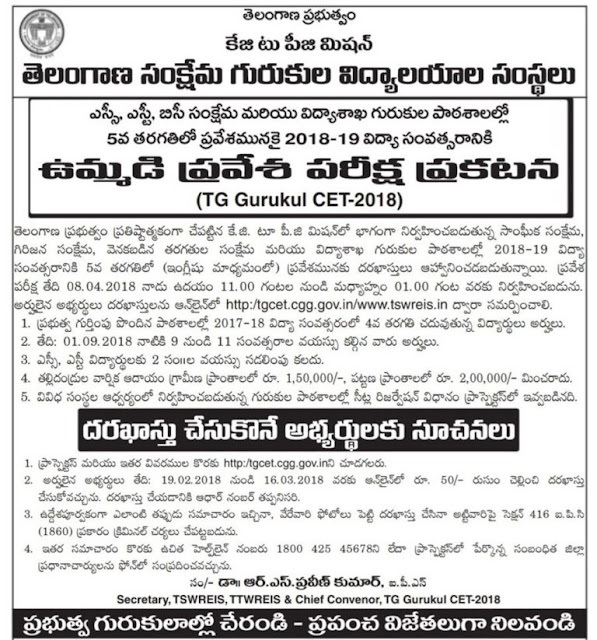 Candidates can submit telangana gurukul cet 2018 application form online only through website tgcet.cgg.gov.in. TGCET 2018 Fee :There is a Rs.50/ registration fee for submission of online application.